NCC Approved & Verified DNV-GL (Maritime) Approved. Exide Technologies, with operations in more than 80 countries and more than 120 years of experience, is one of the worlds largest producers and recyclers of lead-acid batteries. The company develops state-of-the-art energy storage solutions for the automotive and industrial market. Leading car, truck and lift truck manufacturers trust in Exide Technologies as an original equipment supplier. 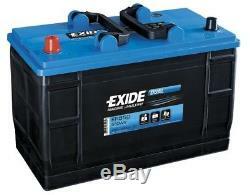 Exide also serves the aftermarket through a portfolio of successful and well-known brands. Ensure safer & longer trips by choosing the right battery. On motorhomes & caravans, safety and comfort depend on an electrical supply to all equipment. This supply is usually provided by batteries, in charge of key operations such as food preservation, water supply, radio/GPS supply and room heating/cooling. As efficient energy storage is crucial to keep the vehicle moving, Exide presents the new Multifit battery offer, covering the energy storage needs of both professional installers and private users. By choosing the right Multifit battery for a motorhome or caravan, the electrical supply will last longer, ensuring enhanced trip duration and comfort. Additionally, new Multifit premium types are certified by DNV all across Europe, guaranteeing safety and manufacturing quality. Batteries designed to supply power to motorhomes & caravans. Its construction provides regular mounting conditions (safe gas conduction by central degassing & spark arrestor), good service conditions (low maintenance, easy electrolyte and charge inspection by SOCI - State Of Charge Indicator) and robustness (medium vibration & tilt resistant, spill-proof). Built in standard flooded technology with central degassing. 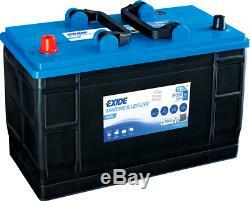 EXIDE MARINE & LEISURE DUAL PURPOSE BATTERY. NCC Registered & Verified Battery - Class B. Perfect for All types of Leisure & Marine Auxiliary Use. Dual Purpose (Starting & Auxiliary) Deep Cycle Battery. Ultra Low Maintenance Heavy Duty Long Life Battery. Integral state of charge indicator. Low self discharge rate giving extended shelf life. Wet Cell Flooded Lead Acid Battery with breathing holes for gassing. Designed for all climates (This battery can withstand severe temperatures). NCC Verified & Approved Battery - CLASS B. Height: 235mm (Height is including Terminals / Posts). Leisure Battery Care & Maintenance. Leisure batteries are manufactured to the very highest of standards, but to get the very best performance and longevity out of your batteries it is well worth following a simple care and maintenance program. Always recharge your battery as soon as you can after use after discharge and keep it as fully charged as possible during long periods of in-activity. Please must use Continual Automatic chargers with these batteries such as GYS FLASH 6.12 or GYS FLASH 8.12 or GYS ARTIC 8000 Fully Automatic Intelligent Connect & Forget Mains Powered Smart Leisure Battery charger can be left attached to the battery for long periods and will look after your battery at correct state of charge until you need it next. Avoid completely discharging your battery (Below 10.5V) as this will reduce its cyclic lifespan. When the battery is out of the caravan/motor-homes etc. Always store it in a cool, dry and well ventilated place. From time to time make sure the terminals are free from dust and dirt, and all connections are sound. Please must not use the trickle charger, split charging system and solar charger to charge deeply dischrged batteries. Only use mains powered battery chargers. An equalizing charge for a 12volt battery required that it be charged with a voltage of at least 14.4 volts for a period of at least one hour once a month, or every 10 discharge cycles. An equalizing charge prevents battery stratification and reduces sulfation, the leading cause of battery failure. Reduced performance can also be an indicator that an equalizing charge is needed. All batteries, regardless of their chemistry, will self-discharge. The rate of self-discharge for lead acid batteries depends on the storage or operating temperature. At a temperature of 80 degrees F. A lead acid battery will self-discharge at a rate of approximately 4% a week. Keeping this in mind if a 125 AH battery is stored for four months (16 weeks) winter without being charged, it will lose 80 amps of its 125-amp capacity. It will also have severe sulfation, which causes additional loss of capacity. Keep your batteries charged while not in use. We Dispatch by COURIER usually next day but may take two days on occasion. If these instructions are not followed(removing bungs immediately) battery may get bulged or explode. INHALATION - Remove from exposure, rest and keep warm. EYE CONTACT - Wash out with plenty of water for at least 15 minutes. SKIN CONTACT - Remove contaminated clothing immediately and wash affected skin with plenty of water. INGESTION - If the electrolyte has been confined to the mouth give large quantities of water as mouth wash ensuring that it is NOT swallowed. If electrolyte has been swallowed, give water to drink immediately. BURNS - Apply sterile bandage. The item "12V 115AH (110ah) EXIDE ER550 Ultra Deep Cycle Leisure Marine Battery 3yrs Wrnty" is in sale since Wednesday, July 25, 2018. This item is in the category "Vehicle Parts & Accessories\Motorhome Parts & Accessories\Caravan Parts\Mobile/ Touring Caravan Parts". The seller is "starterbatteries2011" and is located in Glasgow. This item can be shipped to United Kingdom.